When men look back at this time, they will see it as a time when we displayed, simultaneously, every aspect of our being, both accomplishments and faults. This, of course, is not surprising, for men everywhere stand at various points on the evolutionary ladder but, accepting these natural divisions, which time itself will reduce, there is lacking, still, a unity of approach and an understanding of the needs of all. Why should this be so? For long ages the teachings of successive religions and the eminence of powerful individuals sustained a certain unity of thought in evolving humanity. There were, of course, many periods of war and dissent but at some level the unifying influence of the great religions was maintained. Today, individuality is so potent, so valued and rewarded, that, despite its manifold achievements, this precious individuality has become man’s greatest danger. Unity in any real sense is all but vanquished, even, or perhaps especially, in the religious field. Few there are who see instinctively, as a matter of course, the essential needs of all men. Therein lies the danger. The civilising forces of Justice and Freedom, however, are awakening millions to their birthright. Little by little, the minds of men are turning to the needs of all. This, naturally, runs counter to the rousing call of individuality. Hence the present extraordinary tension and chaotic conditions in the world. The problems, political and economic, are basically of a spiritual nature but can be solved only in the political and economic fields. Unity must be sought and manifested. Otherwise the strains imposed by the present conditions would drive men to the most dangerous actions. For this reason Maitreya calls for Unity, an understanding of the needs of all. Peace is essential but can only be achieved where Justice reigns. Justice, it will be found, needs the calm waters of Trust for its achievement. Sharing alone is Maitreya’s remedy for our ills. Sharing alone will bring men, trusting, to the table where Justice will be achieved and Peace assured. Q. How many interviews has Maitreya given since the 79 (as of 9 November 2012) as published in the December 2012 issue of Share International? A. Maitreya has given five more interviews, making a total of 84 (as of 3 January 2013), 41 of which were in Brazil. Q. Has Maitreya been invited to appear on television in any other country in recent weeks or months? Q. Has Maitreya spoken at all to allay fears that surrounded the myth of the so-called Mayan calendar apocalypse? Q. You recently said that the dark age of Kali Yuga is over. This is momentous news because at times it felt as if the world would go on for quite a while in the ‘bad old days’ way of life. Could you please explain what has happened so that we are now in Aquarius? A. There are different views. The Masters of the Spiritual Hierarchy are divided into two groups – the Trans-Himalayan Lodge and the South Indian Lodge. The Masters of the Trans-Himalayan Lodge, for example Maitreya and His group, believe that we have come to the end of Kali Yuga. This view is not shared by some of the Masters of the South Indian Lodge, but it is the view of Sai Baba, Maitreya and His group, and my Master, and I have no hesitation in sharing it. There are obviously different ways of interpreting the ancient teachings. Q. Have the forces of Materiality been ‘fenced off’ – somehow made somewhat less potent in very recent times? If so is this related to the end of Kali Yuga and the establishing of the new era of the Kalki Avatar – Maitreya? A. One could put it that way. In fact the Forces of Light are indeed winning the struggle for the hearts and minds of men. Q. There are rumours that President Assad of Syria is considering using chemical weapons again the opposition forces. (1) Is there any truth in these rumours? (2) If this were the case, would the Lord of the World, Sanat Kumara, intervene to prevent such an atrocity? I know you have said that He would intervene in the case of nuclear weapons being used. Q. A recent poll of public opinion in the USA indicates that 80 per cent of people say that climate change will be a serious problem for their country if nothing is done about it. This is a substantial increase since a similar poll carried out in 2009. This figure seems surprisingly high. Would you say it is accurate? Q. For a better grip on the present ecological crisis would you please address the following? (1) Is the Industrial Revolution the signal period when the environment began its slide or would the die have been cast later in the 20th century as is commonly thought? (2) If indeed the world has at best 10 years to right this incalculable tragedy, how can we expect this to be effected? (3) Essentially, why are we not too late, even in the best of terms? A. (1) No, earlier, from around the 15th century. The growth in population increased the burning of fossil fuels, so it has been a slow increase from the 15th century. (2) Some aspects are already all but irreversible but if humanity wakes up and takes seriously the severity of the problem, sufficient progress can be made to mitigate the situation. (3) When the Masters are working openly Their advice will help us to reverse the tide of destruction, but we have to start reversing it ourselves. Q. Is it not time for America to change the gun laws and the constitution? Do you think it is anachronistic? A. Yes, but I am not in charge of American law! Q. (1) Recently in a small town, a sick man shot and killed 20 children in a school. There have been other mass killings these last few years, and people experience gun violence every day in the US. In The Laws of Life, Maitreya said eating red meat brings out the animal in people. “Look at the US, biggest meat eaters in the world. It has an obsession with guns.” A cow has to be the most docile animal ever. I don’t understand how the meat of such a passive animal could stir up such violence in people. Please can you explain? (2) I remain agnostic about the Christ’s return. However, I hope. The world is so dark, cold and ugly we need Him. If He is here, how do we maintain our morale until we see Him on television? May I remind you, none of us is close to a Master like you. (3) On a scale of 1-10, 10 being the most likely, how likely is it Maitreya will be interviewed on American on television in 2013, this time by Himself? A. (1) It is not the meat but the blood of the animal that slows the evolution of the human being. (2) Tremendous changes for the better have taken place in the world in the last few years – many predicted by Maitreya – but people forget or do not see their importance. There is more hope now for humanity than there has ever been. People only see and remember the negatives because it impacts clearly on their lives, and especially their fears, but they do not see the improvements which are taking place at the same time. (3) Not until the Day of Declaration. Q. The following is from the Agni Yoga book, Brotherhood, passage 178, which seems relevant to the recent school shooting tragedy in Connecticut, USA. It’s interesting how contemporary some of the Master Morya’s thoughts can be, perhaps much to do with how pervasive the underlying causes are, which don’t much change.“True, the quantity of insane people is monstrous. Not only must they be treated but the cause of the increase in number must be discovered. The weak-minded also need surveillance. Madness is contagious. Weak-mindedness in childhood indicates subsequent abnormality through the entire life. People are agreed that the conditions of life are unhealthy; yet, in spite of this, every advice about improving conditions for health will meet with hostility. In this is contained the fear of any unsettling of the foundations. It is appalling when that which is really most precious is in danger! Caution must be expressed in all of life. When I forewarn about the need of unity, I am anticipating the possibility of explosions. Amid fiery explosions one has to proceed as if on a tightrope.” (1) Do not the conditions of American society provide ample opportunity for such ‘explosions’, these repeated tragedies? (2) What can be further understood of ‘unity’ as referenced in this context? A. (1) Yes, very much so. (2) In American life, but of course not only American life, there is no fundamental sense of brotherhood. Competition is the basic way of living. The result is the formation of knots of tension, which inevitably sooner or later explode into these ‘mad’ senseless tragedies. Q. An angel flying through the air and asked by the Master Jesus to allow Itself to be filmed! (See the signs section of Share International, December 2012 online.) 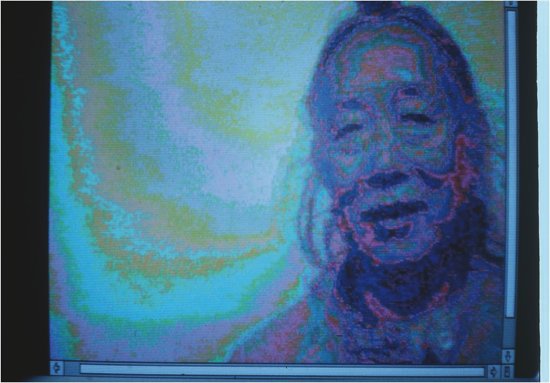 The interesting thing was that in the December 2012 issue of Share International the neurosurgeon who had a near-death experience describes precisely what that NASA photograph revealed – “flocks of transparent, shimmering beings arched across the sky, leaving long, streamer-like lines behind them”. (1) Are our skies always filled with invisible beings flying between planets? (2) Does the fact that the angel concurred with the request made by the Master Jesus indicate that a new phase in our relationship with the Devic world has begun? Q. (1) Was the ‘NASA angel’ (SI, Dec 2012) really flying to the sun or did It only appear to be? (2) Do angels actually ‘fly’ (as in ‘using wings’) or do they simply traverse space? (3) One YouTube video claims to show an angel escorting someone who has just died out through the roof of a hospital and up into the sky above the building: is that what generally happens, whether this particular video is a hoax or not? A. (1) Yes, it was flying towards the sun. (2) They do not fly in the sense of having ‘wings’, which are simply man’s concept. These Devas are momentous natural forces, in this case half the size of the Earth. (3) This is too literal and physical an explanation – but the being does exit the body through the chakra at the top of the head. One Sunday in November 2012, my wife, stepdaughter and I were posting flyers for an upcoming group lecture. After finishing on the college campus in Berkeley, California, we decided to try a small business district just off the campus. At a corner convenience store I was putting up a flyer inside the store, when a man walked in. He was medium height, wore older clothing and had sunglasses on. As he walked in the store I heard him say several times, in a happy, friendly voice, “What a nice store. What a nice, nice store.” It wasn’t something one usually hears in a store. I then went outside to join the others. We were putting up a small advertisement just outside the store’s door when the gentleman came outside and asked us about the posting. He lifted up his sunglasses and started to read the lecture card. As it was a small card, the print was hard to read. But he was able to read the smallest print that mentioned Benjamin Creme and Michiko Ishikawa. He asked us about them, who they were, etc. We gave him a brief synopsis of the story and invited him to the public talk. He said he would try and attend. Throughout our conversation he was quite jovial and made us smile. We exchanged some additional conversation and then he walked away. We walked in the same direction looking for more stores in which to place our flyers. Benjamin Creme’s Master confirms that the man was the Master Jesus. Yes, he was indeed referring to the Day of Declaration and its aftermath. On Christmas Eve 2012, I boarded a bus heading for my job. I sat down in the one free seat available, and I noticed a man sitting in front of me. Something about him caught my attention. Before I knew it we were chatting away. He was holding an earring that he had found. He offered it to me, suggesting that I may have one to match it. The earring was a silver hoop with pink plastic dangling inside. The man gave his seat to a person who boarded the bus, and took a seat across from me that had become available. I noticed myself leaning into him, as I was drawn to him strongly as if he were an old friend that I was happy to see. There was such an ease in our conversation, which surprised me. I was aware of a lightness that I felt. As I looked at him I was aware that he looked like a mixture of being homeless yet dressed suitably for the holidays. He was Caucasian, and his hair was dirty blond and pulled back in a ponytail. His two front teeth were gone and his skin reflected much time in the sun. His eyes were a deep blue with a hint of green that almost seemed smokey to me. The man wore a long leather-type jacket and loafer shoes. He had a green plastic band on his wrist and a red ribbon pinned to his shirt. As he spoke he had such a sureness and dignity, and I saw that other bus passengers were watching us. He said he was on his way to the Veterans Administration hospital to visit his friend. He spoke of his sister, Theresa, who lived with his mother out of state. He asked about the work that I did and what I was doing for the holidays. I told him I was on my way to work and that I am a caregiver. He mentioned that it was okay to exchange simple gifts with family and friends. Then he started talking Chinese in response to something he heard being said by people sitting next to him. This surprised me as he clearly wasn’t Chinese. As the man sat there I noticed a small trumpet that he was holding. On an inner level I acknowledged His presence and thanked Him for His visit if it were in fact Him. My mind seemed to be connecting the dots of feeling I had throughout the visit, along with his having a trumpet. A strong feeling came over me, a sense of knowing: He is readying Himself to come forth! The man got off at the same bus stop that I did, but he exited the front of the bus and I exited the back. I was surprised that he was getting off the bus as I thought he was heading on to the hospital. I looked back to see him but he was gone. What a truly wondrous occurrence. Was this man the Master Jesus or another of the Masters? M.A.S., San Francisco, California, USA. Benjamin Creme’s Master confirms that the man on the bus was the Master Jesus. On 2 November 2012 I was a volunteer worker in a meeting place when I saw a woman in middle age, about 1.65 metres tall, looking at a mural. She had half-long, sleek, bleached hair and was wearing a white stole, a light brown blouse and white pants. She spoke with great reassurance, warmth and involvement. When I approached her I got the strong feeling that I knew her very well and I started the conversation about that. She replied that that could be possible. She said that she would like to come over for the music concerts in the chapel. She indicated that it “is a good place to find yourself, certainly in combination with music”. I told her that the mural (‘peace’ theme) was made by refugee children. “Oh yes, they know all about it.” She pointed at the maxim ‘peace is talking’ and underlined the truth of it, but it happens far too little. A colleague-volunteer worker joined us and urged the woman to take some extra from the biscuit tin he had brought with him, to distribute on the way. The woman thanked him and said that she was distributing in a different way. My colleague had already talked with the woman at another time. “He is a beautiful human being.” After admiring his shirt she pointed at his heart and said with a smile, warningly: “But I look straight through that shirt and know exactly what is going on inside you.” A little later another colleague asked after her name. “I am not telling my name. The energy is important.” With a smile the woman warmly waved everyone goodbye and left. After this meeting I felt myself overflowing with love and happiness. Am I feeling rightly that this was a Master? Benjamin Creme’s Master confirms that the ‘woman’ was the Master Jesus. In October 2012 there was an exceptional woman in a well-frequented street in Limburg. She simply stood and observed the people. She was very radiant, full of kindness, simplicity and humility. Especially when she saw children she was absolutely radiant. We exchanged several more words and I felt blessed. Each time I saw her I had to speak to her and was very joyous afterwards. She then told me that she was a nun, and that her superiors did not understand her and now after many years of obeying she could now only obey God. Initially she stood in Rome at St Peter’s Square but had now been led to Limburg and did not know when she would be recalled. In the end she added: “Everything is in order!” After this she was gone. I cannot forget her as her impression was memorably positive. Am I right in assuming that this ‘woman’ was a Master? (1) On Saturday 20 October 2012 I was at the market in Den Helder with a friend distributing The Emergence Quarterly. When you do this, you meet all kinds of people! Between two market booths I saw a gentleman sitting on a bench. He was the same age as me and was wearing a black coat with flowers in the collar. I said something positive about the flowers. On the left there were daisies in two colours and on the right two colours of roses, but he said they are made of plastic. He knew quite a lot about Maitreya and talked about a planet. He also told me that his bicycle had been stolen and that he had a lot of trouble to get there. I am very interested to know who this gentleman was? (2) About a year ago in 2011 I was distributing The Emergence Quarterly and went to the province of Limburg by train. I got on the train in Heiloo and at the next station, Castricum, a lady got in. She was about 40 years old and was dressed neatly, wearing a black dress. She was wearing make-up which was beautifully applied, it was conspicuous. On purpose I walked past her in the train to tell her that she looked so nice and how did she manage this beautiful make-up? She said you can do that too! I would so much like to know who this smart looking lady was? (3) In 2011 I was in Bergen-Noord distributing The Emergence Quarterly. A lady came by who walked with a deep stoop. I asked if she would like a Quarterly. She was weighed down and moaned. The next time I met an acquaintance very much in trouble, who I could help, everything went well for her and I have the feeling that meeting and helping this acquaintance, and the good outcome for her, had to do with the lady I met. Am I right in this? Who was this lady? Benjamin Creme’s Master confirms that all three encounters were with the Master Jesus. In the early hours of 17 November 2012 after I had attended Transmission Meditation I had trouble getting to sleep. I felt a strong urge to get up and look outside. From my living room (on the second floor, with a magnificent view and facing south) I was astonished to see what seemed to be the four Maitreya’s ‘stars’ in a sort of diamond shaped formation. The top one was very big and was flashing brightly: red-green-yellow and the other three were flashing too but they were not so big. I was filled with happiness. They were positioned in the southwest and I kept watching this for half an hour. It was 2.50am. (2) On 29 November 2012 about 7.20am I saw from my living room south-southeast a very bright star that did not move and was flashing, no colours, just bright white light. (1) Were the four ‘stars’ on 17 November at 2.50am Maitreya’s ‘stars’? (2) Was this very bright ‘star’ a UFO? Benjamin Creme’s Master confirms that the man was the Master Jesus. Late on 13 December 2012, just as night was falling, I was watching television when my attention was diverted to the three glass panes that form the far wall of the room where I was sitting. What at first looked like a shooting star with a tail fell into view from the top left, but then it stopped moving once aligned directly in the centre of the middle pane, literally right before my eyes. It was more like a bright pulsing globe of white light with two smaller red lights at the base. It stood motionless, about a block outside my window, and pulsed for some 30-33 counts. Then slowly it moved into range of the third window panel, receded straight back for about two city blocks and disappeared into a dot next to the tall building there. Could you tell me what this apparition was, who sent it and why? Benjamin Creme’s Master confirms that this was a gift sent by the Master Jesus, as a sign of encouragement. Benjamin Creme’s Master confirms that the cloud formation was manifested by the Master Jesus. Benjamin Creme’s Master confirms that the lights were a fleet of spacecraft from Mars. Russia, Moscow – Two suns – one shining almost as brightly as the other – were seen and filmed in the skies over Moscow on 25 November 2012 and reported on a Russian television news programme. Benjamin Creme’s Master confirms that they were not two suns but only the appearance of two suns. The occurrence was manifested by Maitreya. Benjamin Creme’s Master confirms that the object was a spacecraft from Mars. On 28 November 2012 I knew it was full moon and at about 7pm I looked out at the sky. The moon was indeed full but near it was a very bright ‘star’. I called to my friends “Look! That’s a UFO!” which caused plenty of laughter, of course. But I was convinced. We were about to go to Amsterdam and on the way I stopped to take some photos. I was really happy and excited taking them. Could you tell me what this object was? France, Bugarach – Due to the 21 December Mayan doomsday myth crowds invaded the Pyrenean village of Bugarach in southern France waiting for the end of the world or to be rescued by UFOs. Media teams from various countries were present including a German television team. While the German crew were filming and reporting live from Bugarach a single spacecraft came into view and hovered over the mountain where the 21 December pilgrims had hoped to gather. The craft hung above the mountain for some time before rising vertically at a fairly steady pace before suddenly vanishing. Benjamin Creme’s Master confirms that the craft was from Jupiter. Benjamin Creme’s Master confirms that the actions of the dove were manifested by Maitreya. Benjamin Creme’s Master confirms that this miracle is being manifested by the Master Jesus. A statue of the Madonna has caused a stir among inhabitants of the small town of Salto Grande, 60 km north of Rosario, in the province of Santa Fe, Argentina, since red liquid began flowing from her eyes “as if crying blood”. The blood appears underneath the statue’s protective plastic wrapping and emanates from her eyes, hands and feet. “The whole town is in turmoil because we live very quietly here, and today people from neighbouring towns, and travellers on Route 34, come to see if this is true,” said the mayor of Salto Grande, Juan José Galassi. The 40cm high statue called ‘La Virgen Desatanudos’ (the Virgin who unties the knots) was in the entrance of a healthcare centre. “On Monday night, 3 December 2012, nurse Daniel Ledesma turned on a light and saw that the Virgin’s eyes were red, as if crying blood,” Galassi said. Within two hours nearly 300 people had flocked to see the statue and pray. “People come with health problems, bring photos, gifts and flowers” said Alicia Piazza. News quickly spread and now hundreds of people have visited the health center to see the statue. Benjamin Creme’s Master confirms that this is an authentic sign manifested by Maitreya, to show His closeness. USA, Florida – A photograph of Sally and Dorka, sent by T. R., St Augustine, Florida, USA, shows a light blessing from the Master Jesus. A light blessing from the Master Jesus. The Netherlands – Photograph taken in 2010 in the Netherlands by H.P.G’s granddaughter shows a light blessing from the Master Jesus. We present a selection of quotations on the theme of ‘Man’s momentous choice’. The quotations are taken from Maitreya (Messages from Maitreya the Christ), Benjamin Creme’s Master (A Master Speaks), and Benjamin Creme’s writings. Mankind will be faced by Me with two lines of action; on their decision rests the future of this world. I will show them that the only possible choice is through sharing and mutual interdependence. By this means, man will come into that state of awareness of himself and his purpose which will lead him to the feet of God. The other way is too terrible to contemplate, for it would mean the annihilation of all lifestreams on this Earth. The issues are clear: to continue the race to destruction through competition and greed and so remove all sentient life from planet Earth; or to challenge the advocacy of the past and start anew with safer, wiser counsel. More and more, it becomes evident that a wiser voice is needed in the world, one that will be listened to from many points of view. Such a voice, the voice of Maitreya, will soon be heard above the cries for revenge and hate. Soon, the world will awaken to His presence in our midst and the Great Choice will be offered to men. Thus is this a great testing time for humanity. Thus is this the time of decision, a time without precedent. When men understand this, they will rally to the banner of Maitreya and make known their demands for justice and freedom. They will show their willingness to share and to serve, and thus remake this world. Make your choice well, My friends; make it now. Take your stand with those who wish to share and love, with those for whom Justice is divine. Make now your choice and let your light shine forth and ease My path. When the world’s goods are shared more equitably, half of man’s problems will vanish overnight. Already, there are indications that many realize this, and the call for sharing is rising on every hand. The wise foresee the need for sharing as the only basis of lasting peace, and the heroes of the young lend, too, their popular voice. "The first step is the sharing of the world's resources, because if we do not do this we will destroy ourselves. It is as simple as that." (Benjamin Creme, Maitreya's Mission Volume Three) Photo: Meryl Tihanyi. The resources of the Earth are finite but with good husbandry and sharing, adequate for the needs of all. Men must, therefore, redefine these needs, and enter into a new and truer understanding of the meaning and the purpose of their lives. This will come when a measure, even, of sharing has replaced the present destructive competition, and led man away from the precipice edge. The choice is man’s: to share and flourish, or to continue in deadly competition and together die. The immediate task is the galvanizing of world public opinion. Otherwise, His call for justice would go unimplemented. When the alternatives before the race – peace through sharing; or war and self-destruction – are clearly understood, millions will align themselves with the advocacy of the Christ, and call for an end to injustice, misery and war. The task before the Christ will be so to guide this mounting cry for freedom, sharing and peace that the minimum cleavage results. Half the world’s population now lives in poverty; enormous gaps exist between the rich and poor. Inherent in the tensions thus engendered is great danger for mankind. The Christ will point the way forward, reducing step by step these inequalities and tensions, so ensuring a relatively tranquil transition to the New Age. All has been carefully planned beforehand. Nothing has been left to chance; but humanity itself will determine the speed of implementation of the needed changes, for mankind’s free will may never be infringed. Maitreya will show you that the way to the stars is a feasible journey of enlightenment. He will show that the units of the one life manifest themselves throughout Cosmos; that until now this knowledge has been withheld from men but will provide a sure path for future generations to follow. It is little known today that in ancient times, when man was younger and wiser, the word to ‘steal’ was unknown in any language. The Masters of Wisdom then lived openly among men and encouraged them to live without crime. No door was locked and sharing was the norm. For long ages, in many areas, this blessed state pertained. Maitreya knows that men will rightly choose; that He has not come in vain. He knows that burning brightly in men’s hearts is the aspiration, the longing, for brotherhood and justice, for right relationship and trust. Maitreya’s leadership and love are the twin keys to unlock the hearts of men. We rally to man’s need. We strive to teach and serve. Man himself must act, and test his divinity in the crucible of experience. Benjamin Creme: People do not understand the saying in the Bible: “I come not to bring peace but a sword [the Sword of Cleavage]. I will set men against men, sons against fathers, brother against brother.” It is a symbolic way of stating a great fact, that humanity does not see the best way to go, because it has no judgement, no tolerance, is badly educated, and so it tends to go the wrong way – not every time, of course, but as often as not. It ends up in calamity and war. If humanity knew the way, there would be conflict of course, but it would not necessarily lead to war and mass destruction. The Sword of Cleavage, curiously enough, is the reality but maybe not the one you expect. The Sword of Cleavage is really the energy of love. The energy of love is the sword which creates cleavage in the world. Cleavage is difference, separation, and yet, when we understand it, that energy is released to the world by Maitreya Who is the Avatar of Love. He releases that love in the world and it stimulates everybody without exception, the good, the bad, the altruistic, the selfish, the greedy, the unselfish, and so on. Everybody is stimulated. The energy itself is purely impersonal, it is neither good nor bad. It is an energy which stimulates, it brings together all peoples, and even the particles of matter which hold the world together. The particles of matter in our body are held together by that same energy. For them it is worse because they only see the worst. But at the same time, if they would look with educated eyes they would see a new world, they would see differences: more tolerance, new ideas, people like Nelson Mandela released after 27 years in prison, the end of apartheid, the reunification of Germany, the division into autonomous states in the Soviet Union where ‘unity’ was imposed by an elite on the people of Russia. The world has dramatically changed. The Cold War is over. America and Russia are, maybe not friends, but friendly. They can talk together. All of this is the action of the Law of Love. This creates the Sword of Cleavage so that humanity will see clearly what the choice is: do we share and recreate the world, make it possible for all people to live together in peace and plenty, “where no man lacks; where no two days are alike; where the Joy of Brotherhood manifests through all men”, as Maitreya said [Message No.3]. Or do we continue with the corruption and misery and eventually see the annihilation of our world? That is the choice before humanity. Maitreya will emphasize this and people will see clearly. But people can see clearly even today. As far as Maitreya is concerned they are already seeing the choice which we have to make: between sharing and justice for everyone or a growing distance between peoples and a war which would destroy all life. That is the Sword of Cleavage. The pairs of opposites have never been clearer: gross materialism, stock exchanges reeling because of overwhelming greed, and at the same time people dying in millions from starvation. Maitreya’s Sword of Cleavage forces humanity to make a choice: to share or die. He states it clearly: “Men must share or die. There is no other course.” When it dawns on us that we share or we die, of course we will accept to share and that will create the conditions in which all can live in peace. Benjamin Creme: Yes. Not everybody is selfish and competitive. Probably the majority of people are partly selfish and partly altruistic; people are mixed, not one hundred per cent this or that. There are degrees of selfishness and altruism. There is a great body of people who are ready for an unselfish action, ready to see justice in the world and therefore sharing. About five or six years ago, I asked my Master whether Maitreya had His one billion yet. Yes…. Now (as of 2006), there are [nearly two billion] people He can call on – more than enough. Besides, we have no alternative. If I offer you life or death – what are you going to take? Maitreya will say: “You have a choice. Choose life, if you are sensible, and create a brilliant, golden, civilization, better than anything the world has ever seen. Or face annihilation.” Which are you going to choose? There has never been an Avatar, a Teacher, of such potency as Maitreya. Have no fear. The world will change quickly from being greedy and selfish to showing the true quality of humanity. From Maitreya’s point of view humanity is wonderful. Maitreya loves humanity. Not only because He is the Lord of Love – that is why He is able to love humanity – despite everything, despite all our greed and selfishness. But He also sees the light of divinity in humanity. He is the head of the kingdom of souls and He sees the soul of humanity and that soul is in every single human being. No matter how selfish or hateful we might seem, He sees that light of divinity in us, and on that you can rely. There comes a time in the history of men, nations and races when they must reorient themselves to the reality of the life in which they have their being, and seek to understand the purpose of their existence and the means by which that purpose may better be fulfilled. Today, the present race of men – the fifth in historical sequence – and all the nations, stand at such a point. Soon, men everywhere will be called upon to weigh heavily the consequence of their actions. On their decisions rests the future of this world. Very soon, now, Maitreya will present the nations with a momentous choice: to continue in the present fearful, self-destructive mode and perish, one and all; or to follow Him into a simpler, saner, safer way of living which will guarantee a happier future for all the peoples of Earth and link man once again to his destiny as an evolving son of God. When men understand the nature of the choice before them – happiness or extinction – they will surely hesitate but little in making their decision. To help them in that undertaking, Maitreya will analyse the present problems and show in all clarity the results of the various actions that men might take. Gifted as He is with foresight and age-old experience, He will remind men of their divine heritage, and show them the way to claim their inheritance. Thus shall it be. Thus shall “the Teacher of men and of angels” begin His mission, and thus shall the sons of men restart their journey to become the Sons of God. Assailed on all sides by the relentless pressure of market forces, men are gradually awakening to its antidote: a truer understanding of the mystery and beauty of all life. Ground down and marginalized by rampant commercialization, men are turning to the nurturing fire of their inner lives, and finding solace therein. A myriad miracles, East and West, remind them of the unseen presence of the divine in life, and hold before them the promise of a better future for men. When people hear the claim that someone called Maitreya, a new World Teacher as powerful as the Buddha or the Christ, is in our midst, most are curious about the source, the rationale and the evidence. For 40 years, Benjamin Creme, the main source for this revelation, has – patiently and consistently – provided the rationale and pointed out mounting evidence that such a remarkable being is, indeed, among us. In The Reappearance of the Christ and the Masters of Wisdom, first published in the UK in 1979, and in the USA in 1980, Creme narrates the events that led to his pivotal role in Maitreya’s Emergence; in addition, he articulates the principles that underlie the Emergence and surveys transformations that have taken place, some that are under way, and others yet to be realized. Benjamin Creme begins by explaining how a perfectly sensible, practical family man and dedicated artist could set aside his life’s work in favor of a very different task – one that would consume most of his waking hours and subject him to a wide variety of reactions from others. He relates a series of extraordinary childhood experiences, including the capacity to actually see air and wind – not just their effects – until he was told by grown-ups that such a thing was impossible. So he stopped noticing. But he did not forget. As a young man he pursued experiments designed to recapture and understand those early experiences in a systematic and scientific manner. In his middle years, he experimented with methods to focus his mind and improve his concentration during meditation. And throughout, he read widely, especially the great Eastern philosophers of the 20th century (a partial list can be found at the end of the book). Although he didn’t realize it at the time, Creme was systematically preparing himself for his future role as a spokesperson for Maitreya, the emerging World Teacher. It was only then that Benjamin Creme realized these heady messages came with strings; they caused, he writes, “a complete upset to my thinking”. But there was more unsettling news from the Master: “The time is coming when you will be expected to act” and “Affirm His coming.” Curiously, Creme was, at that point, granted a 17-year reprieve during which, one guesses, he hoped the Teachers would forget about him. Instead, in the early 1970s a rigorous course of instruction and training began. When Creme was ready – if not entirely eager – to fulfill the responsibility for which he had trained most of his life, he still had serious misgivings about taking his message to the public: “I didn’t like it. I didn’t like it at all. I liked what I was doing. I liked working quietly, esoterically, knowing I was doing something useful, but neither too strenuous nor making too great psychological demands on me.” He adds, “It is an enormous, and embarrassing claim to have to make – that the Christ is giving messages through oneself.” Yet by the time I met Benjamin Creme in 1980, there was no sign of embarrassment or discomfort. Then, as now, he was quite matter-of-fact when discussing his work, whether speaking to hundreds in a large auditorium or relaxed at a family dinner table. Over the years, he has always been the same – extremely intelligent, immensely kind, modest, witty – and completely dedicated to his work. The book’s introduction, which outlines what he calls “The New Age of Synthesis”, is based on a paper Creme gave at a 1977 educational conference, and it remains entirely relevant in 2013. It is a crystal-clear analysis of the Emergence and its purpose, and it is remarkable for its consistency with events as they have unfolded over the ensuing 36 years. A fitting prelude to the idea of a World Teacher in our midst, the introduction argues for “new approaches to reality … and the values which should govern our lives,” culminating in a more just and rational society worldwide. Additionally, the introduction is a useful summary for people who know the history of the Emergence but have forgotten some of the details. To the most recent edition, Mr Creme adds an update which includes the most significant developments connected with Maitreya’s emergence between 1977 and 2007. The longest section of the book is composed of audience questions and Creme’s responses, largely drawn from meetings at Friends’ House in London in the late 1970s. They provide a snapshot of the period leading up to 1979-80, when the world experienced tectonic power shifts politically, economically and technologically. Little noted at the time, these shifts began to build themselves into a series of quiet – but significant – revolutions. In ways barely registered, small sectors in our society reconfigured themselves, nibbling away at the carefully guarded and elaborately maintained power structures that had been in place for centuries. These infant transformations were soon followed by a rise in political activism and social entrepreneurship – little noticed at the time but now woven into the fabric of our daily lives, throughout the world. In the 1970s the world was, as it had been for centuries, organized into many small hierarchies, mostly operating under the aegis of government, business and family. In communications, people worldwide depended upon utilities such as telegraph and land-line telephones, as well as government postal services for communication; in many remote places, news still travelled by foot. Now the whole world knows almost instantly when a disaster or an attack strikes, no matter how remote the location. We learn news directly from those most affected, as millions of us are instantly in touch, fostering a far more participatory culture and fertile information environment than mankind has experienced before. These changes should tell us, if nothing else, that something remarkable is afoot. At the conclusion of The Reappearance of the Christ and the Masters of Wisdom are 12 messages given by Maitreya between 1977 and 1979. On 18 April 1978, Maitreya offers a very simple recipe for hope: “... the problems of Mankind can be solved: through the process of sharing and just redistribution the needs of all can be met.” Sounds impossible? Wait and see. Benjamin Creme. The Reappearance of the Christ and the Masters of Wisdom. Amsterdam, London: Share International Foundation, 1979, 1980, 2007. As of December 2012, CCL had citizens lobbying teams in 72 US cities and 10 in Canada. CCL’s volunteers have had 848 meetings with their Congressional representatives in the last three years to discuss the problem of climate change and legislative solutions such as a revenue-neutral carbon tax, and have had over 1,000 newspaper articles, letters to the editor, and opinion pieces published. Cher Gilmore interviewed Marshall Saunders for Share International. Share International: What motivated you to start Citizens Climate Lobby? Marshall Saunders: I was part of an organization called the Microcredit Summit Campaign. A group of us met in 1997 and promised the world and ourselves 100 million little loans for very poor women by the end of the year 2005. It was a year later that we accomplished that goal of 100 million loans. But about 25 per cent of those women were in Bangladesh, and much of that country is virtually at sea level. I thought, here we are trying to get another 5,000 loans in Mexico, and we’re going to lose half a million or so due to flooding in Bangladesh! That was one of the things that influenced me. As far as starting the Citizens Climate Lobby itself, I saw Al Gore’s movie, An Inconvenient Truth. I went back to see it, and went to see it a third time within just 10 days or two weeks. I was struck by it. I had no idea we were in so much trouble. When I saw that movie I wanted to DO something. Okay, what do I do? I saw that Mr Gore and his team were going to train 1,000 people – this was 2006 – and I begged them to train me. So they trained me, and I started giving presentations. I clearly remember sitting at the kitchen counter one morning reading the San Diego Union-Tribune. I’d given about four or five of those presentations, and the paper said that the day before, Congress had voted 18 billion dollars to oil and coal companies in tax credits. I’d gotten about 18 light bulbs changed, I thought, and I said to myself, this is not going to work. The Microcredit Summit Campaign is part of an organization called RESULTS [a citizens lobbying group formed in 1980 to generate the political will to end hunger and the worst aspects of poverty]. I had been a partner and a group leader here in San Diego, and I thought, what we need is an organization like RESULTS, but lobbying on the climate. So I started looking around for one. This seemed to be one of those moments when I had to do it myself or forget about it. Of course, I couldn’t forget about it, so I called Sam Daley-Harris [the founder of RESULTS], and he said he’d help me. I didn’t have an environmental mailing list and didn’t know very much, but Sam said don’t worry about that. So I called just about everybody I knew, and 29 people met in a local library. We talked for about three hours and formed three lobby teams, so it was a good start. SI: What is CCL’s mission? MS: It’s very simple and clear. We have two purposes. The first is to create the political will for a stable climate, and the second is to empower people to have breakthroughs in exercising their personal and political power. Regarding the second part, when I first started with RESULTS and I met for the first time with a member of Congress, he was there in his blue serge suit, Republican tie, and shiny shoes. I was 50 years old and had done a lot of public speaking, but I was tongue-tied. Just being in the presence of what I perceived to be power, I forgot what I was going to say. Then some of my RESULTS teammates got me going and asked me a question or two and I did pretty well. SI: You must have a way of training volunteers to do this kind of lobbying work. MS: We do. The first thing we do is invite people to take part in our introductory call. We have this call every Wednesday at 5pm Pacific Time, and it goes for about an hour. We lay out the ground game for what we do and how we do it, and for those people who would like to start a group we ask them to call us back in the next day or two and we take the next steps. Then we’ll coach and encourage people to invite their friends and come together for a group start meeting. That’s about a three-hour presentation, very participatory. They practice having a meeting with their members of House and Senate, and we talk a lot about the bill we’re in favor of. Then we gently encourage them to meet with their members of Congress and the editorial board of their paper. We also have a monthly national call with guest speakers in which we train our partners ongoingly. We have economists who are leaders in the field of pricing carbon, and physicists, scientists and engineers on the calls. We have members of Congress telling us how to lobby them. Jim Hansen [a leading climate change scientist at NASA] has been a speaker two times, and Rob Shapiro, an economist. Really top people. So, we keep on training. And almost once a week the group leaders talk for about 45 minutes. A lot of the training is encouragement, and seeing what’s possible. People know how to do these things, but they just don’t do them because they don’t feel empowered to. They’ve never seen it done before. So we have reports from the field, and they hear, for instance, that the group in Norman, Oklahoma, has gotten an opinion piece published by The Daily Oklahoman. They hear that the group in Cleveland has gotten an op-ed or even an editorial published in The Cleveland Plain Dealer. They begin to think, “Well, if they can do it...” It creates a possibility for people. SI: Can individuals participate if they don’t have a group nearby? MS: Yes. They would be on the national conference call, and then they’d go to the website and download the action sheet. We have a terrific action sheet of three or four pages every month for every national call. It gives the name of the speaker for that month’s call, their bio, what the subject is, and two or three actions that people are asked to take. It will have a laser talk (which is the essential idea for the month) that we want to deliver to members of Congress and write letters to the editor and opinion pieces on. The action sheet may also have an example of a letter to a member of Congress or to a newspaper. So somebody could just do that. I am sure that creating political will is a team sport. I don’t think anybody can do it by themselves for very long, because they’ll get discouraged. By the time you’ve called the editor of the editorial page 10 times and haven’t talked to anybody, and you don’t have a team with you to talk to and encourage you, you’re not going to stay with it. And when you go in to meet with a member of Congress, you don’t want to go by yourself. You might forget what you’re going to say! We kind of do things for each other. You get an affinity for your teammates and you play the game together – like a football team. SI: Are people getting involved in the large numbers that are needed, and are you having an effect? MS: We’ve been doubling our numbers every year. We should easily visit every member of Congress, and I think by the end of 2013 we’re going to have a group in all 50 states. We’re in about 33 states now. Over the last three years, we’ve had about a thousand articles published. We are expecting, I think reasonably, 400 people to the international conference this year. One of the reasons I think we’re appealing is that we’re not partisan, we’re non-confrontational, and we’re not trying to win with force. We are trying to be friends and appeal to people’s highest interests. We think the reality is on our side, and we’re going to keep saying it, and be friendly. We’re not going to be mad at [the deniers]. We’re not going to denigrate them. We’re going to be their friends and keep talking to them. For a long time [in the 1800s], it was forbidden to talk about slavery in the Congress. It was called the gag rule, and we’ve been facing something of the same thing. It’s like Congress is forbidden to talk about new taxes, and forbidden to talk about climate change. But just about three weeks ago, Senator Murkowski from Alaska said a carbon tax is the talk of the town. It was anathema to talk about it just three months before. And then the American Enterprise Institute – very conservative – held an all-day seminar on carbon taxes, in combination with the International Monetary Fund, the Brookings Institute and one other group. So the silence was broken, and I think we played a big role in that. Citizens Climate Lobby International conference attendees, 2012, just before a lobby day. That week they visited 302 US congressional offices. SI: Would you see that as the group’s most significant accomplishment so far? MS: I think so – breaking the silence on a carbon tax in Washington. We’re in favor of a steadily increasing tax over 10 years to get the tax up to $100 to $130 a ton. We think that’s the foundation stone for reducing carbon dioxide emissions, and that tax is really for carbon dioxide and its equivalents, like methane and hydrofluorocarbons. SI: Do you think it’s likely that a good carbon tax bill will be written and passed in the next Congress? MS: Well, it’s our goal. Is it likely? I hesitate to say, but I’m going to give it everything I’ve got – treasure and time – and all of our partners will too. We now have about 500 partners on these national calls. There’s a lot of power against us, but we’re going to stay right there. We’re not going away. SI: Isn’t it important for all the organizations concerned with the environment to work together in joint efforts to get the needed traction for change? MS: We have a very focused solution, and we believe that we’re part of this whole movement. We can’t do everything. For us to continue our very stringent focus on a carbon tax and rebate, it’s difficult for us to turn our attention to a mass demonstration and all that that requires. I think about CCL as the point of the spear. A revenue neutral carbon tax is what has to be done. It’s the foundational piece. But we’re all working together, as I see it. Everybody’s doing their part. SI: How can people help? MS: There are a lot of things people can do, but I think if we don’t adopt public policy then nothing else is going to matter. We need public policy, and we need people to give up their hopelessness and powerlessness. We need them to educate themselves and participate with a group of people and realize that public policy is going to occur in the United States Congress. We’re in the extraordinary position of being a world leader, having access to our government, having a democracy and the power to talk, and we have the internet. We have all these tools to use, now let’s use them! SI: Is there anything else about climate change you’d like to say? MS: We have absolutely got to wake up. Everybody knows the ice is melting, right? How do you keep ice from melting? Stop heating it up, and cool it off too. If it’s melting at 390 parts per million [the current concentration of CO2 in the atmosphere], we need to go back to 350 ppm. So that’s not just reducing the emissions – that’s reducing the concentration. We have to do that. Human beings have to wake up to being responsible – not just for our own little selves, but for all of life. ALL of life. We are responsible for all of life. There needs to be, frankly, a transformation of human beings. Ultimately that’s what’s at stake. Have you ever heard this quote from C.Wright Mills: “In our time what is at issue is the very nature of humankind, the image we have of our limits and possibilities. History is not yet done with its exploration of the limits of what it means to be human.” I think we’re going to see whether human beings can learn to be responsible for all of life. Humankind is waking up, and that’s what the second purpose of CCL means – wake up! Realize that you are responsible and you do have power that you don’t know you have, and use it! Science knows there is something just beyond its present grasp – frustratingly near – but a more complete picture is yet to emerge. The missing piece of the puzzle in this case has been variously described as dark matter, dark energy, an aspect of Einstein’s theory of gravity – a “cosmological constant”, perhaps the cause of the expansion of the universe, possibly “some strange kind of energy-fluid which filled space”. NASA admits that even now “more is unknown than known”. Science decrees that seeing is believing; whereas perhaps more secrets would be unlocked if that were to be inverted to a rather more esoteric approach – “believing is seeing” – indicating that an open-minded approach to any unknown may allow the researcher to see what she might otherwise dismiss as being impossible. And in a sense that is what has been foisted upon astrophysicists and other scientists who have become aware of the existence of that elusive something. Harry Oldfield does not purport to know the secrets of the universe but his research has led him to conclusions that physicists might find very interesting. Felicity Eliot first interviewed Harry Oldfield for Share International in March 1982 and now revisits his work. Positive thought and energy from a Tibetan Lama. Share International: What attracted you to this field of work? How did you get started? Harry Oldfield: Psychic discoveries behind the Iron Curtain was the title of a fascinating book I came across by Sheila Ostrander and Lynn Schroeder. It detailed the work of Semyon and Valentina Kirlian, two Ukrainian researchers. I was immediately interested. As a science and biology teacher I’ve always had an open mind. It was in the 1930s that Semyon Kirlian and his wife Valentina developed what is now called Kirlian photography. They conducted experiments in which photographic film was placed on top of a conducting plate, and another conductor was attached to a hand, a leaf or other plant material. The conductors were energized by a high frequency high voltage power source, producing photographic images typically showing a silhouette of the object surrounded by an aura of light. And when I saw a photograph of a so-called ‘phantom leaf’ effect I just couldn’t believe my eyes. In their book they generously provided diagrams of how to make the sort of camera used to photograph this energy field. So within a couple of days I’d made my own and started experimenting straight away. Energy picture of phantom arm. Energy picture from the side of phantom arm. SI: How should we understand this phenomenon? H.O: I believe it shows the subtle energy of a sub-atomic energy matrix. When you look at me you’re not really seeing me at all. What you’re seeing is an outer form which is strung over and based on another subtler form, an energy body which is in a constant state of change. 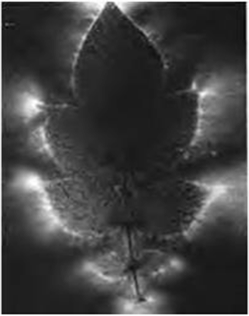 In the physical leaf which the Kirlians used in their experimental photography a large percentage of the leaf was cut away – but the subtle shape of the leaf remained. SI: So we’re really talking about ‘energy fields’ that are not dense physical matter and normally invisible but that your instruments pick up? H.O: Yes. What we have been able to show is an energy interaction with light, giving an insight into the energy counterpart, which is the basis or template on which our physical molecules are strung. On average, every atom in the human body is replaced every seven to nine years. Think of your body not as a physical structure but as a moving fountain of molecules that are constantly being replaced. So what keeps them a coherent recognisable form? I believe it to be an organising template of energy. To go back to basics, in Kirlian photography the actual quantum physical particle that produced the picture was an electron – it was an electron effect that produced a coronal discharge effect around the object and also underneath the object which was recorded onto light sensitive film. There were no lenses involved. 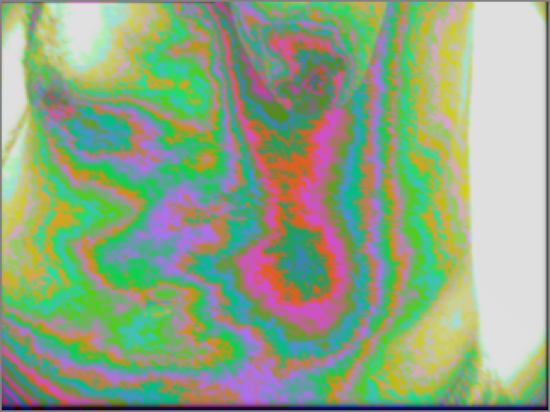 The energy itself imprinted onto the film. Kirlian technology had a few limitations: it was two-dimensional. The depth of field was very flat. I tried to develop a three-dimensional technology. I think I was one of the few people outside of Russia who was researching along these lines and one of the first to invent a three dimensional kirlian-type camera. In fact it’s detailed in a book of mine called The Dark Side of the Brain: Major Discoveries in the Use of Kirlian Photography and Electrocrystal Therapy. SI: Am I correct in thinking that the Kirlian system was used with your co-operation as a diagnostic tool in a hospital or hospitals in Britain? H.O: Yes, at the time it was. The doctor I worked with was a biochemist and cytologist researcher. He suggested that rather than looking at plants and fruit specimens that we look at cancerous cells in patients and compare them with normal cells. We decided to look at the energy signature of different cells. So as you can imagine we were quite ahead of the time. We tried to get it accepted as a diagnostic research tool which could reveal problem areas before they became visible on the physical level. Unfortunately, there was also some psychic research interest in this field and the mainstream found it difficult to accept. SI: And then you went on to develop what you call the New Energy Vision. H.O: Yes, that’s right. In the last couple of years we’ve improved our technology. Now we’ve taken our research and inventions a step further. We now use what we’ve called the New Energy Vision (NEV) system which is a modern version of earlier phases of my work and a further development. In the last couple of years this work has really moved ahead and I’m proud to say that the new programme was developed by my son, Anthony Oldfield. SI: How does it work? H.O: If we look at the work of Kirlian again the quantum particle that produced the image was the electron. What we’re using now with NEV – is photonic. In Kirlian photography an electron produced interference with subtle energy on a photographic plate – that is, it was two-dimensional. What we’ve been able to do with NEV is to look at three-dimensional shapes, for example human beings with their own energy – and we can show the subtle energy that lies below the surface physical body. And we’re able to show it in various forms and various colours. We point a camera at someone; it’s hooked up to the computer which uses software. This software has special functions called algorithms which look at what is happening when a photon travels in and out of a person’s energy field. So it shows them but with different forms and colours. SI: If you photograph someone who is apparently healthy using NEV and you also photograph someone who is known to be ill what can be seen? Are there marked differences? H.O: Oh, the two results are totally different. But before we go on, I must make it clear that I am not saying this should take the place of a thorough medical diagnosis. But to get back to the results we see with NEV: in the healthy person we see the chakras or energy centres and also the meridians known and used in acupuncture and the chakras recognised in ancient medical practices such as in India and China. I’ve lectured and taught people in both those countries including natural medicine doctors of each country to use this system. 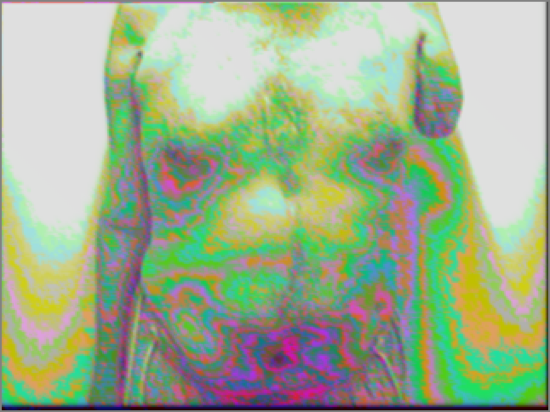 We see different colours and patterns on the human being, mapped in this way and also in the outer field or what some people call an outer energetic process, or the aura – not a word I use too much because it is in fact a by-product of the life force energy field working in a person’s body. We can show in and around the person the power of positive thinking, for instance, or the converse. If someone’s thinking loving, positive thoughts or is in a state of elevated consciousness such as in meditation the colours brighten and expand and even flood out even into the environment. However, when a person is depressed the colours and the energy field contracts and become denser and dark. You’ve heard the saying that someone has a dark cloud over them – well we’ve actually seen a dark cloud of energy hanging over a negative depressed individual. SI: Does age make a difference to the energy field? Does gender play a role? Are there differences and or similarities that indicate a pattern in different countries? Are there seasonal changes or variations in people? H.O: It’s as complicated and complex as looking at an individual. People vary so much – perhaps they feel different in different seasons. Twins in the same family show variations but interestingly enough we’ve noticed that in twins there is a sort of mirror image in the energy field. For example, if one twin has a little ‘block’ of energy in the subtle body on their right temple the other twin will have a similar ‘block’, but on the left temple. This indicates how detailed our research can be. Curiously enough, we detected similarities and consistent difference within professions. When, for example, I took a picture of a stressed individual working in the docklands in London, compared with someone working in an ashram in Rishikesh there is a great universal difference. A stockbroker on a good day at work tends to have a bright, clear ‘aura’ – although they still have the ulcer! But a yoga master in India shows a steady state of luminosity which doesn’t vary. In such individuals stress hardly occurs or affects them. SI: I’d like to ask you about “dark matter”. H.O: It was quite a while ago now that cosmologists, astrophysicists, astronomers started looking into the galaxy; the spin-rate of stars in the centre of the galaxy indicated that they were spinning in a way which indicated there was not enough matter to explain the spin rate – there had to be another explanation – some hidden matter to explain this. Calculations led them to conclude that 90-something per cent of the matter in the universe was invisible – hence the term “dark matter”. Further research tried to calculate the expansion speed of the universe after the Big Bang. After more research cosmologists announced that the universe was speeding up. They concluded that there had to be energy everywhere in the universe that is moving things apart. Think of dark matter and gravity that bring things closer together; dark energy is moving things apart. So it is the other force in cosmology. This is, of course, an oversimplified explanation. SI: Would you go as far as to say that much of what is known as the ‘etheric’ in esoteric literature or the ancient wisdom teachings is the same as what science is calling dark matter and dark energy? H.O: I think it is highly likely. In many of the energetic forms that I see with NEV not only around people but also in and around sacred places, and crop circles, there is this etheric component which cannot be ignored. In fact, I would go so far as to say that cosmology has not been able to get the unified field theory so far because the ether has been left out of the equation. 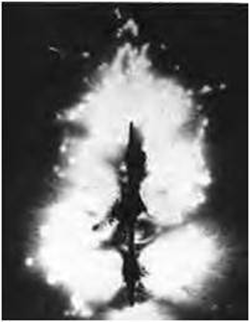 Plant showing kirlian energy shortly after leaves were removed. SI: Do you think that this is exactly the next big discovery? It’s as if we’re waiting for science to catch up with ancient knowledge. H.O: Exactly! Yes, to catch up. I believe with the dark matter and etheric made up of subtler and subtler layers which we can’t see normally – are energies which we could say are ‘leaking’ into our space-time universal co-ordinates. We’re not just talking here of three dimensions – we’re talking about several more. Professor Stephen Hawking talks of 10 dimensions. SI: Moving from the cosmological to the individual again and what we deal with in our daily lives, would this explain why and how homeopathy works, why acupuncture works, why telepathy is possible? There must be a medium through which energy – a thought, for instance, can travel, would you say? H.O: Yes, absolutely. And furthermore perhaps this is an aspect which should be taken into account in research into the continuation of life or consciousness after the death of the physical body. The ‘deceased’ are transformed into their subtle energy body – not visible to most people. SI: It seems that we are living at a time when science is on the verge of endorsing and confirming ancient knowledge – that everything is energy. Do you think the two are coming together now? * For scientific mathematical model refer to: V.French, P.J.Bryant, S.V.Bryant, Science, 1976, Pattern regulation in epimorphic fields, 193, 969-81; V. French, P.J.Bryant, S.V.Bryant, Science, 1981, Distal regeneration and symmetry, 212, 993-1002. Today, many mathematicians and physicists acknowledge the idea that the Universe as we know it, with its galaxies, stars and planets, kingdoms of nature including human beings, cannot have been created by simple chance, but that there must be, behind it, what they call “information” – information which for example “tells” the atoms of matter to stick together to form a table, a plant, or the magazine you are reading. Imagine all the sand present on Earth, on land and under the oceans. Say you have painted one of the grains of that sand red. Now, you ask a blind person to pick up that one grain from all this huge quantity of sand. Well, he or she has a much greater chance of finding precisely that red grain, than the Universe has of cohering. To explain how the stars form, how the matter of our body sticks together, scientists calculated that there must exist a particle, which is not made of matter. It is called the Higgs’s boson (after British physicist Peter Higgs) and is also known as the “God particle”. All Higgs’s boson particles, it is posited, form a field, a sort of invisible glue, in which matter would bathe. This field would explain the mass of matter (1). The more the elemental parts of matter resist, are slowed down by the field, the more their mass is significant. The less the glue sticks to the elemental parts the less the parts have a mass (as in the case of photons, the particles of light). Without the existence of that field, which is not made of matter (it has no existence in terms of spatial dimension or time – scientists call it “information”), aggregated matter would not be possible. The particles of matter in the Universe would not ‘stick together’. As esotericists will know, dense physical matter is made by a precipitation of what already exists in the etheric field. If confirmed, the recent tests at CERN (2), proving the existence of Higg’s bosons, is a new step towards confirmation of the value of esoteric teachings such as those written by Helena P. Blavatsky or Alice A. Bailey, under guidance of Masters of Wisdom. Even if there is still a way to go before we have scientific proof of the existence of the soul, as understood in these teachings, scientists already recognise that matter comes from “information”, which some of them even call “God’s thought”. “God” in this sense, could be understood as something existing outside the Universe, which gave the necessary information, just before the Big Bang, which enabled particles to organise matter as we know it. Indeed, in 1931, logician Kurt Gödel published his famous “incompleteness theorems”, which posit that the Universe, particularly its cause, cannot be explained, without reference to something which is exterior to it. And in 1995, Nobel prize winner and physicist Gerard ’t Hooft and his colleague Leonard Susskind proposed a theory according to which the content of the information of the whole universe would be located outside our usual space-time frame, and therefore would only be understandable through its incomplete and partial projection within our universe and our lives. This scientific research is moving towards the discoveries predicted by esotericism, and more generally towards the rapprochement between science and religion.